Seeing multifunctional furniture pieces drop from the ceiling, stairs that pull out like drawers, cribs that transform into beds, coffee tables that lift to become desks, bi-fold doors disguised as a bookcase … it really is a bit like seeing Alice in her wonderland turned funhouse. Ingenious designs like these are helping crowded city slickers and small family home dwellers max their square footage making almost every space more livable. Can I have a double, please? Space-efficient furniture has to be comfortable and stylish, serve at least two functions, and make use of areas that would be otherwise neglected. If it accomplishes all three goals, the results can be most decidedly beautiful and modern. Foyers form a guest’s first impression. Sure, you could put conventional entry way furniture there to hold your house keys and occasional stamped letter, but if you choose a media console instead, with shelves and doors, you could hide half the things jammed into your coat closet, plus albums, laptops and other media equipment, kids’ toys and much more. Now let’s take a look at the TV. 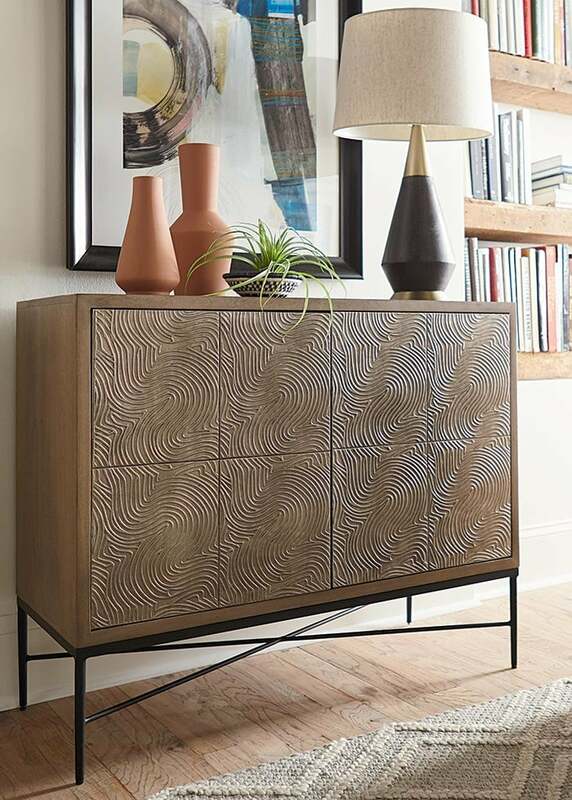 You could put it on a simple TV stand or you could use something multi-functional like an accent chest and have drawers to corral the remote, umpteen pairs of eyeglasses, out of season sweaters, placemats and table linens, blankets and bed linens … get the picture? Changing tables have really changed. You could choose a sturdy and stylish dry sink style table with removable hutch designed for changing baby. Or choose one of today’s innovative dressers that serves as a changing table but become a big kid dresser simply by removing the galley rails; other dressers offer matching hutch pieces for much-needed shelving – especially in kids’ rooms (think stuffed animals, books, and photos). In the bedroom, storage options abound. 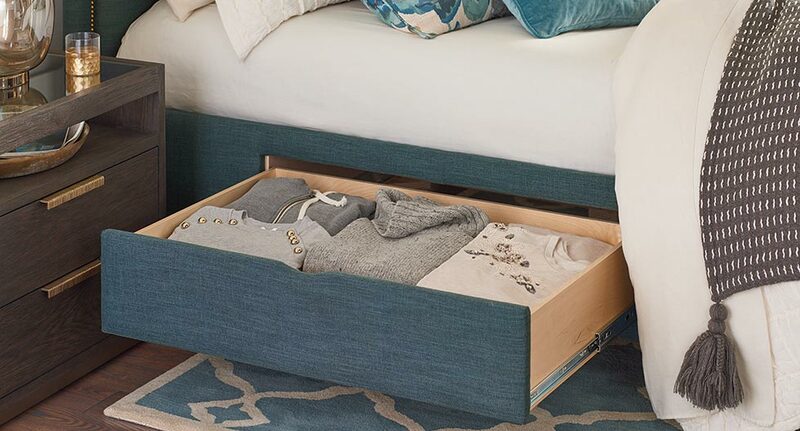 From beds with drawers that slide out from under to a handsome storage ottoman at the foot of the bed. While we’re here, swap space-saving accent tables for bulky night stands and revel in the airy extra space you’ve gained. For more small living space ideas, sign up for our catalog and emails. Shop online anytime or find a store near you today.